After all this time you’d think that I would have figured out how to go back to older postings here on the site, update them, then bring them up to the front. Because if things change on a subsequent visit, or if I hear something major has changed, I like to make sure we’re all in the same loop. But not being so tech-savvy, I decided just to start with a clean plate after a recent visit to Les Rubis, even though not much has changed since my last visit. In fact, I don’t think anything has changed since my first one, which was probably decades ago. One thing I am better at, though, is keeping up with Pam Williams, who I met almost about ten years back when she was launching Ecole Chocolat, her online chocolate school. She lives in Canada, but comes to Paris annually with her students, and it has become our tradition to have lunch together. No matter what is happening, or how crazy my life is, Pam and her husband’s visits have become one of the few calming presences in my life. (It might help that last time they gave me a spa gift certificate, since I was in the middle of a rather torturous remodel.) But I really mostly enjoy their annual visit because they’re such nice people (trés canadienne) and are funny, we can openly talk about anything, and they’re just all-around good dining companions. Oh yeah, and she also brings chocolate along. Because I’m not Canadian, it’s I who usually has to decide where we’re going to dine. (As the Canadian friend once told me, “I’m Canadian. I don’t have an opinion.”) And since I hadn’t written about – or revisited, Le Rubis in ages – Pam liked my suggestion and definitively decided that we go there. Le Rubis not the place to come if you are looking to shed a few kilos. Of the five main courses on our recent visit, three featured sausages. (The fourth was also sausage, but was wiped off the menu with a finger as it was sold-out.) The “vegetable-oriented” course was cabbage, stuffed with ground meat. 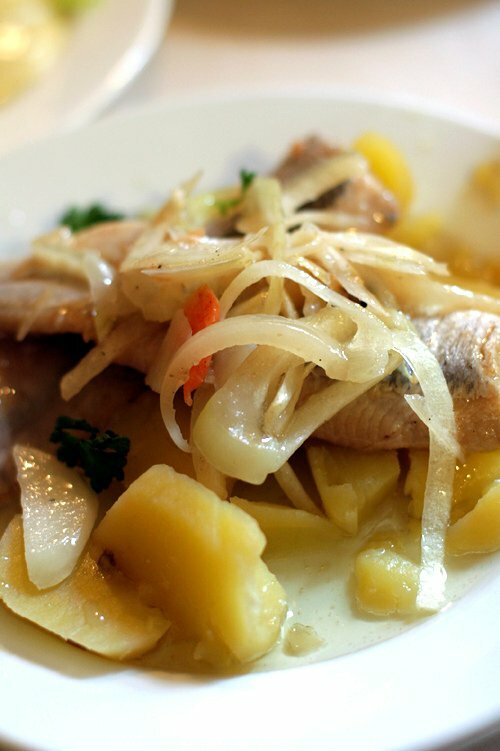 But no problem – if you were avoiding sausage, there was a plate of tripe on offer. However I was feeling stuffed from too-many meals lately, so I ordered les œufs mayonnaise to start, a duo of hard-cooked eggs which arrived with quite a bit more mayo than anticipated, and herring salad with potatoes. 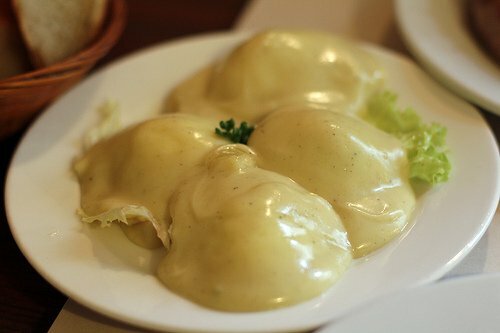 I was recently having a discussion with someone stateside about whether two hard-cooked eggs was too much, the quantity in which the French will often serve this bistro classic. And even though Americans are known for our copious serving sizes, my first course could challenge even the heartiest American, or French (or Canadian) appetites. The wine list is heavy on reds, but there are plenty of whites and a few rosés to sip with a charcuterie plate late in the afternoon, if you come after the lunch crowd. 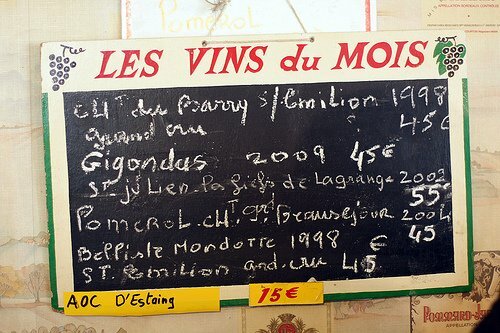 In spite of the prices shown on the “Wines of the Month” list at the top of the post, there is an extensive list of wines by the glass and by the pot. And when we had a hard time deciding whether to have wine, and how much (that part of Canadianism has worn off on me, I guess – the being nice part, though, i’m still adapting to), the waitress decisively made the decision for us and plunked down a 37.5cl carafe of the house Brouilly, which was chilled and just the right wine for our afternoon lunch. Most wines are available in small or larger glasses, and hover at about €3 or so for a nice glass. 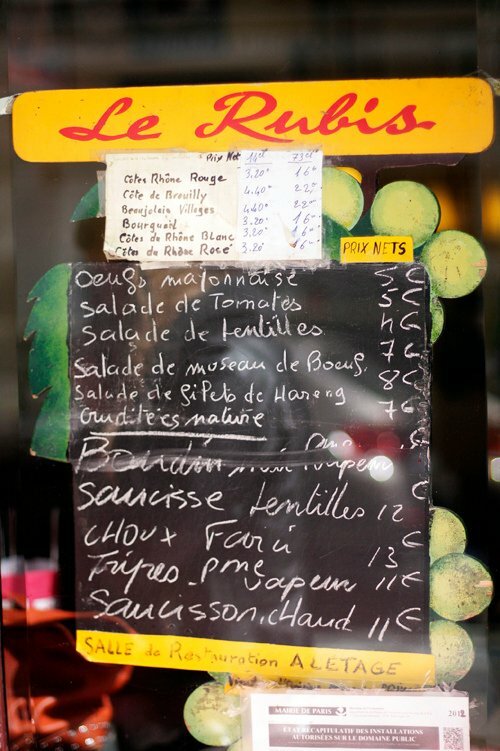 Le Rubis only serves hot meals at lunchtime and it’s always filled with regulars from the neighborhood, as there are few options next to the decidedly swanky rue Saint-Honoré, the famed shopping street adjacent to the wine bar. But if you come in the early evening or late afternoon, you can have a nice plate of charcuterie and a glass or two of whatever wines that they happen to be pouring. And it makes a great stop before dinner elsewhere. Many patrons finish their meal with coffee and a smoke outside. 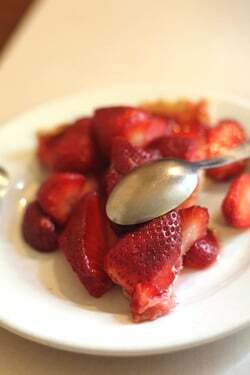 We shared a Tarte aux fraises, which probably would have more satisfying if it had been just a nice, juicy bowl of strawberries and perhaps a dollop of crème fraîche, as we left most of the crust behind. But in such a small, friendly place, the atmosphere is what counts the most. And there’s no way you’re going to leave hungry – whether you have dessert, or not. I’m always amused by the way French people consider eggs a light dish. Here in the Touraine countryside I have been assured that the starter on offer was très legère and it turned out to be 3 hardboiled eggs stuffed with tuna and napped with copious mayo. I remember the first time I went to Nancy and was served Baeckeoffe, the baked meat and vegetable casserole, it was also described to me as “light” – I guess since it doesn’t have cream in it, it was considered legère, too! Oh yum, that looks so good! I adore lentils, and my husband insists he doesn’t like them (he always used to!) so I can seldom have them. The saucisse aux lentilles looks like heaven on a plate! Did anybody have the tomato salad? It can be either incredibly good or incredibly disappointing. When we were in Paris the other weekend, my husband ordered oeufs dur mayonaise, and got, improbably, 2 ½ eggs! (I had 6 snails, which I adore once in awhile). All in all, I wish I’d been with you! oh god, french soul food. even i, a refusenik when it comes to soft cooked eggs, adored oeufs mayo the first time i ever had them. too bad my hubby is a vegetarian, we rarely spend time in places like this. thx for the vicarious experience tho. I had some bad oeufs mayonnaise last trip…not literally bad, just not very good. Those look great and Le Rubis is on the list for my next trip. And lentils + sausage is a lovely match. Wish people used lentils more here in the US! 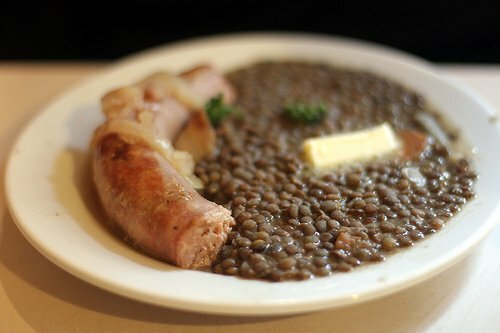 I’m curious about the saucisse lentilles – is that a large pat of butter on the lentils? This looks wonderful. I wish I’d tried it when I lived in Paris. Canadians are truly the loveliest as well. I’m glad that they help you destress when you at your most stressed. 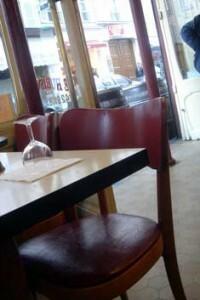 David – thanks for posting a review of a honest, traditional French bistro. There’s something extremely comforting about the food in such places, and although I appreciate “haute-cuisine,” a plate of sausage and lentils does wonders sometimes. I wish restaurants in the US would have the attitude with wine the Europeans have – that it’s an essential part of the meal and doesn’t need to be fawned over – just bring a small carafe to the table and have at it! Recently had ouefs mayonnaise – two eggs as you describe but served face up – at A La Biche au Bois. I know it’s a French bistro staple and even has an annual prize awarded for the bistro with the best version, but it does leave me a bit underwhelmed. I had menu envy for my husband’s pate. I do recommend the main courses here though – far and away the best partridge I have ever eaten. My son declared the potato puree ‘sublime’ which he ate with a coq au vin so rich one could happily climb into the pot and luxuriate. Sirloin with pepper sauce also outstanding. Good frites too. Brouilly chilled just right and the waiter a delightful showman. Very happy food. Desserts a let down though. Your pastry skills are needed in that kitchen. One of my favorites for more than 30 years. And you’re right: it hasn’t changed. This is the only place where I really like Beaujolais (actually Morgon). 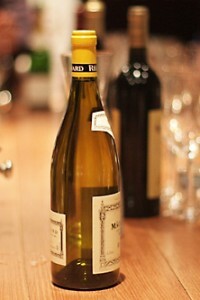 There is a freshness to their wines from that region that I have never experienced elsewhere, even in France. This sounds (and looks) like comfort food – which to me is always on the heavy side … but that can be a good thing! It’s sometimes what you need after a busy day! I’m headed to Paris tomorrow and will keep this in mind. Also see you listed Verjus — I am definitely headed there. I managed to snag a seat at the Hidden Kitchen during one of my previous visits (at the last miniute, too, when somebody else canceled) and can’t wait to pay their wine bar & restaurant a visit. How about sitting down? So you do not have to apologize to the ladies. 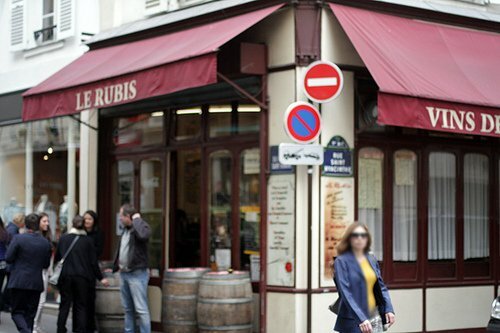 Ah, Le Rubis, a place in my heart. I first stumbled into this lovely little gem about 12 years ago on a freezing cold, sleeting February afternoon, in tears because I was so cold and lost and spoke (at that time) very little French. I’ll never forget my waiter’s name. Remy. He seated me, tisk-tisked me and wiped my tears, brought me a lovely glass of wine and a plate of snacks and proceeded in what little English he spoke to tell me where I was and how to get where I needed to go. Such a gentleman. Warmed and now full, he sent me on my way and charged me not one centime for the wine or the food. Remy is no longer there, but when I return to Paris every winter, I also return to Le Rubis. French comfort food and fond memories. I totally agree, a small friendly place where the atmosphere is what counts the most. Sometimes the big swanky French cuisines are just not as pleasant. I do love the eggs but not so much the heavy mayo. I’ll put Le Rubis on my to do list for next year’s visit :) Thanks so much for the French comfort food go to spot. Re: Lynn’s comment: Yes, suddenly I said “What? David’s Canadian??! !” I even started look for your bio, to verify it. Looks like a really great place with good prices to boot. Sometimes that simple unpretentious food is so perfect. Just heading to Paris next week, I look forward to trying this place out!! Lovely! But am not sure what you’re referring to. If it is too hard, check out my Tips for Making Homemade Ice Cream Softer. Well, David, after reading your wonderful blog about Le Rubis…. I want to hop on the very next plane to Paris and check it out for myself! As to the critics on the “Canadian” issue… I was, at first, annoyed that those two were being too “picky”. However, when I read, further down, your comment “I can’t barely…. I, too, feel compelled to gently chastise you for double-negative/improper syntax use! Just blame the fact that I am British-born and fussy about such things. I love your blogs and have three of your books which I cherish. After reading today’s blog, I must purchase “The Perfect Scoop”, because I have two granddaughter sho love ice cream but are lactose-intolerant. Keep up the good work with your blogs… I read them daily along with breakfast and a cafe au lait! This all looks so enticing. I love the shot of the wine bottle. It has to be the most unaffected and unassuming wine label I’ve ever seen. Simply gorgeous. It looks old. Or is it simply from a contemporary vigneron who has nothing to prove? I have pass le Rubis so many times and been enticed…ir looks special. I must go inside next time! One of all time favs over 10 years, great, it’s in aspic…never changes (prices up of course). When I hear about great little French places such as this it makes me so jealous of the relaxed confidence with which they offer a wine list and pairings. In England you either pay through the nose for it while someone looks down their’s while you choose. Or it is seen as the night of snobbery to want choice greater than red or white. Doh! Reading that Canadians don’t have opinions stung a little bit. I think we just want people to like us so we keep our opinions to ourselves and listen to yours. Wait, maybe that is just this Canadian! Having just tasted (inhaled) the Comte, aged 36 months, you recommended as The Best Cheese in the World, I would so go to Le Rubis if only I ate meat. Never mind, I am on to the green lentils from Puy. Canadian using your site as travel guide while in Paris. I’m finding the salads as bad here as at home.The lettuce is junk – can’t find a “decent salad” in a cafe or very good food in general in cafes. I’m here for 6 weeks, hope to do better! Hubby and I spent many an afternoon here having a Kir Royale an a Pastis. Oh how funny! We were just there 2 nights ago when it was pouring rain- with the intent to come back for lunch, so I can write about it from the gluten-free perspective on my blog! It’s a great place, and I love the vintage 50’s neon. 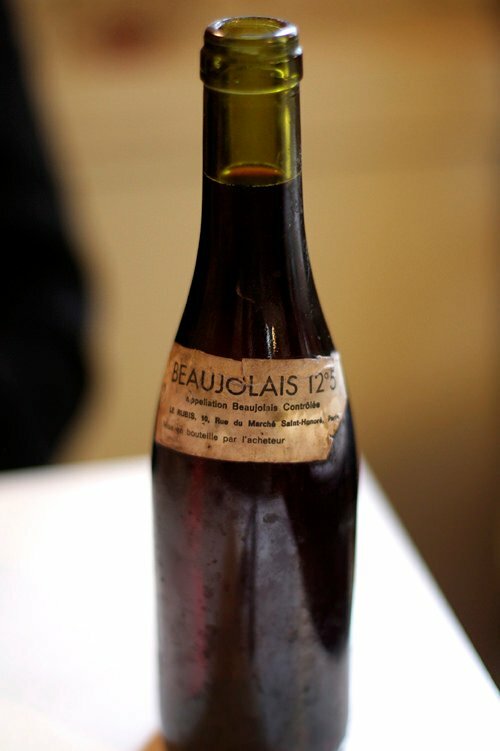 We had an incredible house Beaujolais and our hostess was so sweet with my daughters. We had forgotten our umbrellas and arrived soaked to the skin! It’s a great place and one I’m happy to see celebrated! Since you mentioned older posts, I’d love to tell you that your Fruitcake Bars from a couple of years ago are fabulous and have become my energy bars for long bike rides. I have shared them with other cyclists who love them, and have shared your recipe too. I made a small change to the recipe (because cyclists need lots of carbs while riding) which is to reduce the quantity of nuts and add more dried fruit. Thank you so much! PS: Canadian’s, like most people, have lots of opinions! 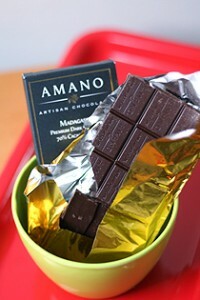 Such as: your blog is great, Paris is great, Fruitcake Bars are great!! What a simply intoxicating post. I so not know Paris, having been there for just a week many years ago. Through your website with your lovely descriptive writing, and your photographs – not to mention your humor and humanity, I feel I have come to know the place. Thank you for the many hours of enjoyment you bring. You didn’t answer if that was a (large) pat of butter on the lentils. I am ever so interested! This was so much fun to read. 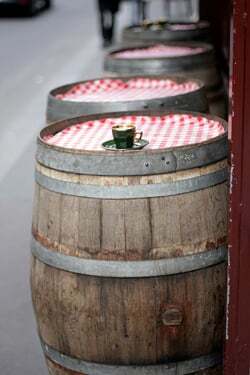 I think I introduced you to Le Rubis in the distant past … I have a photo of the two of us grinning with glasses of wine standing at one of the checker-topped barrels out front. I know it was along time ago because you had platinum blonde hair and I was still a “decided” redhead! Here’s to some things changing and others staying the same. I’ve been a long time reader of your blog and it’s always a go to when I need a break from work. I noticed your comment about having trouble with reading HTML and thought you might want to check out the following links for some HTML editors. I’m not sure what process you go through to post your articles but I thought you might like these suggestions. Dude me too, Im a calming presence and really really nice. Wont bring chocolate, though, you get plenty. Saucisson chaud? Sounds a bit ordinary …..
Why are you editing in HTML? Isn’t this a wordpress blog? Just hit the “Visual” button above your ‘edit post’ window. You can do your writing in MSWord, but save as plain text (so you don’t get any weird symbols popping up in HTML) and paste into wordpress. Quick and easy to add styles via the visual mode.